What are Vacuum Insulated Pipes? Vacuum Insulated Pipes (VIP) are prefabricated insulated pipe sections, where these sections are connected via easy to install, extremely low heat leak and close tolerance bayonet joints. VIPs are used for safe and effective transport of liquid nitrogen for MBE process and cold-testing of integrated chips (ICs) in the semiconductor assembly and test facility. At Cryogas, we offer both systems comprising of dynamic vacuum and static vacuum technology for our vacuum insulated pipes. Our customers can choose if they prefer an external pump – a dynamic system, as part of their entire piping system; or they can opt to have a static installation instead without an external pump, solely relying on the vacuum quality of our evacuated and sealed static pipes. Also, under each dynamic and static system, we have modular pipes which consists both flexible and rigid pipes; modular valves that has T-pattern and Y-pattern; modular pipe fittings include elbow 90º, elbow 45º, Tee, Y, and cross fitting; and various other cryogenic products. It’s important to know that all our pipes, valves and fittings have a bayonet ending – precisely machined out to provide close tolerance bayonet joints with minimal heat leak possible. Besides that, Cryogas offers a complete line of components to maximize the system performance, such as Cryovent – a keep-full device to ensure the entire system is constantly running full of liquid nitrogen by expelling gas vapor. Cryovent’s optional attachment is a vent heater to warm the gas vapors exiting the vent outlet will not be frosty. Phase Separators with both atmospheric pressure type and adjustable pressure type are available to suit end user’s application. Each section is constructed of an inner pipe surrounded by a concentrically-positioned outer pipe. The inner pipe is wrapped with multi layer laminar insulation material with chemical getters granules positioned between the layers. The annular space is completely evacuated to below atmospheric pressure and maintain permanently sealed with very high vacuum. Flexible vacuum insulated liquid nitrogen transfer hoses are used in a wide variety of applications including tool connections and custom OEM applications. 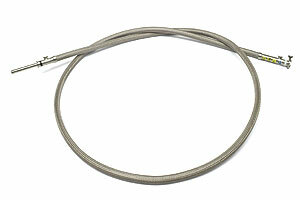 The coaxial bellowed construction and braid outer design allows for optimal flexibility. The use of lightweight stainless steel reduces cool-down loss to an absolute minimum. DynaFlex VIPs utilizes an external vacuum pump to maintain the system vacuum. Jumper hoses are used to connect the vacuum annulus of each section of pipe. Available in two standard sizes: C5 (0.625"/15.88mm ID) and C10 (1.25"/31.75mm ID). StatiFlex pipe is evacuated and sealed at the factory eliminating the need for an on-site vacuum pump. Available in three sizes: C5 (0.625”/15.88mm ID), C10 (1.25”/31.75mm ID), and C20 (2.0”/50.80mm ID). 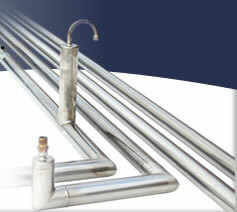 Rigid VIPs are all stainless steel coaxial vacuum insulated piping system. Modular by design, Rigid VIP spools are joined together with close tolerance bayonet connections. Each section is evacuated, sealed and then tested for vacuum integrity. This advanced piping system minimizes heat gain between the inner carrier pipe and the outer jacket. 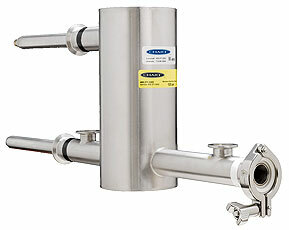 Our rigid VIP product minimizes pressure drop and improves flow characteristics. By incorporating strategically located flexible sections when required, Rigid VIPs are easy to install for both indoor and outdoor installations. Cryogas offer a complete line of components including in-line venting devices, phase separators and gas traps to maximize the system performance.